Organize and track invoices, expenses, and transactions project-by-project with QuickBooks Online Plus. Projects is a feature of QuickBooks Online Plus that lets you organize all the pieces of a job – like sales, expenses, and timesheets – in one place. It makes it easy to track each project or job separately so you have more visibility and can make informed decisions. Projects gives you a central place to get a bird’s-eye view of your jobs and projects. Because Projects helps you connect invoices, expenses, and transactions to each project, you can quickly see where you’re spending your time, which expenses have been paid, how many hours you’ve worked on the project, and more. With the Projects feature of QuickBooks Online Plus, you can quickly access your active projects, assign transactions to them, and get project-specific reports. You can also create a budget for each project, change the project’s status to reflect what stage it’s in, and keep track of notes and other documents. See how much you’re making or losing on each individual project or job. Easily tag invoices, expenses, timesheets, bills, and incoming payments to a specific project or job and then review the Project Profitability Report to know exactly where you stand. 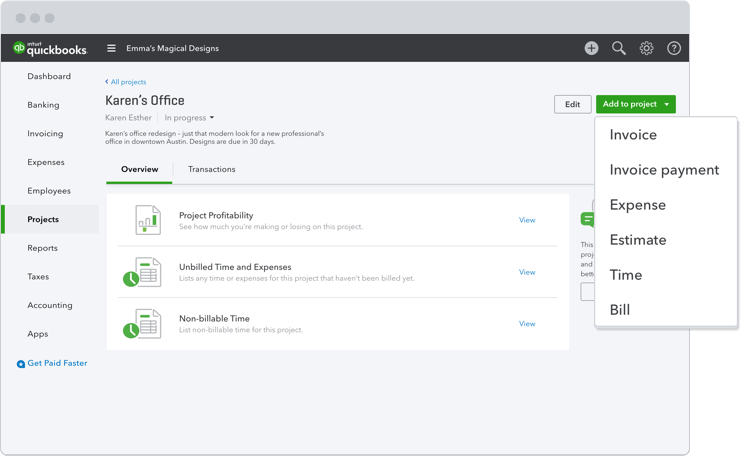 With the Projects feature in QuickBooks Online Plus, you can access project-specific reports like Project Profitability, Unbilled Time and Expenses, Non-billable Time, and Transactions Lists. These four custom reports help you understand the full scope of a project or job. With Projects, you can access reports specific to each job and project. QuickBooks also makes it easy to understand how your business is doing overall through your accounting dashboard, by running profit and loss reports, by reviewing your balance sheet, and more. More than just managing projects. Run your entire business with QuickBooks. QuickBooks makes it easy to bill incrementally and accept payments throughout the course of the project, instead of taking a deposit at the beginning and payment at the end. With the progress invoicing feature in QuickBooks, you can divide an estimate into multiple invoices based on project milestone or stage. Easily create and send invoices with QuickBooks. Tag invoices to a specific project or job so that transactions are automatically tracked and organized by project for you. Your customer can choose to pay the invoice via credit card, debit card, free bank transfer, PayPal, Apple Pay, or others. The QuickBooks mobile app comes with built-in receipt scanning to help you track and organize your expenses. Simply snap a photo of a receipt and QuickBooks will attach it to the expense and let you tag it to a specific job or project. How do I turn on Projects in QuickBooks? Turning on Projects is easy, but please remember that you need QuickBooks Online Plus in order to access this feature. First, select the Gear icon at the top then ‘Account and Settings’ (or ‘Company Settings’). Select ‘Advanced’ and then choose ‘Turn on Projects.’ You can also do this in the reverse to turn off Projects. Can I create a budget for each of my projects? Yes. Create your budget and then select ‘Subdivide by Customer.’ Next, choose the project the budget is for. It’s that easy. Now you have a budget assigned to your project. How do I access my Projects in QuickBooks? To access Projects in QuickBooks, you need to be using QuickBooks Online Plus and have turned on the Projects feature (see above). Then you can Select Projects from the left menu to see the projects and projects details tabs. Projects are sorted first by Status and Parent Customer, and then alphabetically by project name. You can choose to set the project into one of 3 different statuses: In progress, Completed, and Canceled.